After a fairly consistent (if not great) run in the polls for the first ten months of 2015, President Barack Obama finished the year on a decidedly downward slope. While the gains he made at the start of the year haven't completely eroded back to where he spent most of 2014, if Obama doesn't reverse the trend soon he could be looking at similar numbers within the next few months. This trend is clearly visible in the new chart for December. As it has for at least six months -- and as it will for the next ten months -- the presidential campaign was the center of attention in the political world last month. It is looking more probable that Donald Trump is on track to win the Republican nomination, and that has caused a certain amount of desperation among the other GOP candidates and the GOP establishment. This is going to increase into an absolute frenzy in January, as the Iowa caucuses approach. The Democratic race could be just as contentious, but the media isn't really paying much attention, preferring instead to dote on every outrageous comment from Trump. None of this really has much to do with Obama's poll ratings, it should be said, but that has been where the political media's attention has been -- and will continue to be, right up to November. There was political news which (if we weren't heading into an election year) would normally have influenced public opinion on how the president is doing his job. A big budget standoff was avoided by Speaker of the House Paul Ryan, who explained to his angry caucus that the bill was essentially all John Boehner's fault, and they had to get it out of the way before showing America what a truly conservative agenda would consist of. This avoided a year-end shutdown siege, and was actually one of the more reasonable compromise budget bills we've seen during Obama's term in office. But the public didn't pay it much attention. There was good news from the battlefield in Iraq, as government forces backed by allied airstrikes retook the city of Ramadi from the Islamic State, continuing a year-long erosion of the territory the Islamic State controls. Progress has been slow, but gradual. But it didn't get all that much attention, either. What really shook up the political world in December happened on only the second day of the month, as two terrorists went on a shooting spree in San Bernardino, California. This had more impact on the political discussion than anything else, all month long. Republicans, led by Trump, were quick to demagogue the issue, as Democrats, led by Obama, tried once again to make the appeal for gun safety legislation. Little of this did much to assuage the public's fears, however. 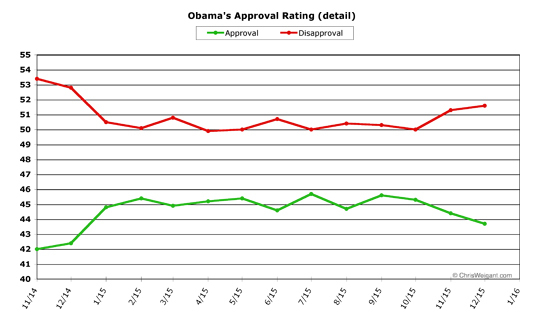 This was likely the biggest factor in Obama's polling woes during the month. Obama's monthly job approval average fell 0.7 percent in December, after a slide of 0.9 percent the previous month. This puts him at 43.7 percent, notably the first time in 2015 he's fallen below 44.0 percent. The news wasn't as bad in Obama's monthly job disapproval numbers, but that's mostly because they had risen so sharply in November. Obama's job disapproval rose 0.3 percent in December to wind up at 51.6 percent (after rising 1.3 percent in November). Still, a yearly high for Obama here. Over the last three months, Obama has lost almost two full points in monthly job approval: down 0.3 percent in October, 0.9 percent in November, and 0.7 percent last month. That's the biggest slide he saw all year long, and the first time in over a year he posted three negative months in a row. Things weren't quite as bad in the job disapproval category, which rose only 1.6 points in the last two months (after falling 0.3 points in October, for a three-month net of plus 1.3 points). Obama is still in better shape than where he ended up 2014, that's about the best thing you can say at this point. In December of 2014, he was at 42.4 percent approval and 52.8 percent disapproval. And he's a long way from rock-bottom for his second term, which he hit in September of 2014, at 41.5 percent approval and 53.5 percent disapproval. That's the bad news. 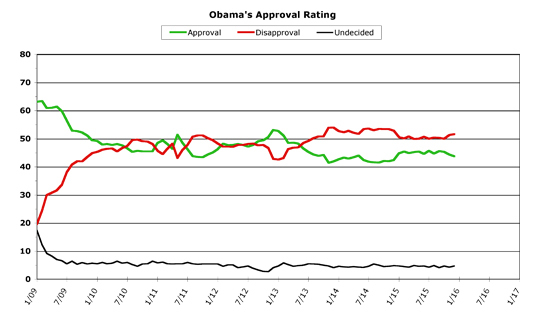 But there might be some good news for Obama in January, if his own history is any guide. Not counting his first year in office (he wasn't sworn in until the end of January in 2009, after all), Obama has improved his poll numbers four times in January and only lost ground twice. And when he gains, he usually gains quite a bit. The data for his four good years: in January 2011 Obama's job approval rose a whopping 3.0 percent, in January 2012 he went up 1.2 percent, January of 2014 saw a 0.8 percent rise, and last year he gained an impressive 2.4 percent in the first month of the year. That's a pretty strong track record. 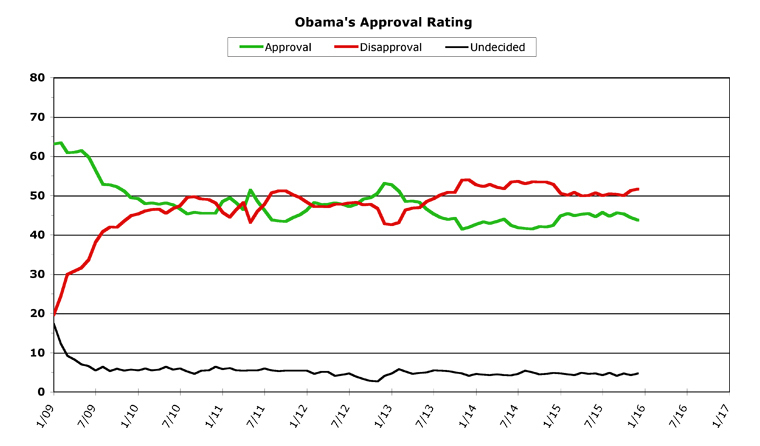 If Obama can capture the January magic this year he could turn around the slide he's been on for the past few months. That's a big "if," though. Obama will be giving his last State Of The Union address in a few weeks, and "last" usually means people begin using the term "lame duck" to describe presidents in their final year in office (the term isn't technically correct until after the election, but it gets used anyway). In much of 2015, Obama drove the political agenda in Washington, which was rather astonishing, seeing as how Republicans had complete control of Congress. The question this year, however, is going to be if anything that happens in Washington can break through the circus atmosphere of the presidential campaign. Pretty much everything Obama asks Congress to do in his big speech likely won't happen, to put this another way. Instead, we can look forward to vote after vote on bills that have precisely zero chance of being enacted (Obama's veto pen will likely be busier this year than all his previous years in office combined), for purely political reasons. Obama will be at the center of attention come June, as the Supreme Court hands down decisions with a heavy bearing on his legacy (the immigration issue, in particular), but that's a long way off and it's impossible to predict what the court will do. 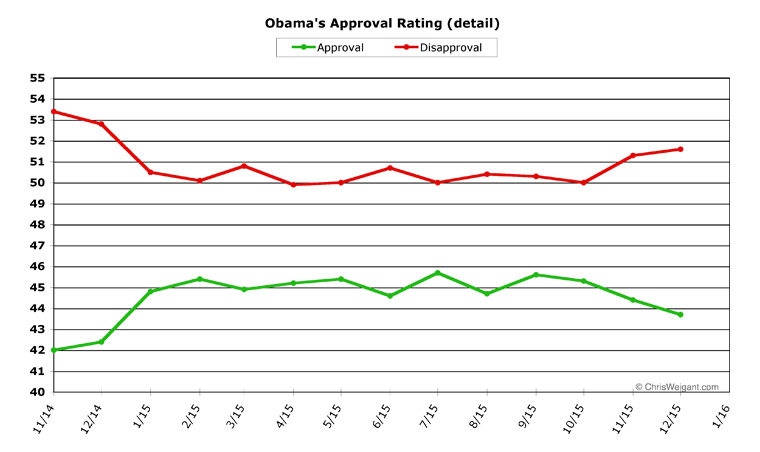 At this point, predicting the trend in job approval polling for Obama in January is a gut call, at best. Anything could really happen at this point -- his numbers could continue their big slide, he could plateau and hold steady, or he could get a big boost from rolling out ideas for the State Of The Union speech (as he's successfully done in the past). My instinct says Obama will probably at least stop the damage and flatten out in January (at worst), but this time around that is a purely gut-call reaction, I have to admit. BHO needs to tell Rahm to go away.